Remember that, next time you get the urge to revise the past five chapters three quarters of the way through. But in the meantime, try these handy-dandy tips to break the ice and get that pen to paper. I mean, assuming you haven’t done this already. Story ideas come in all shapes and sizes— so being able to pack it into a genre is going to make your job ten times easier from the get go. Let’s say, for example, your story starts with two friends going jogging. 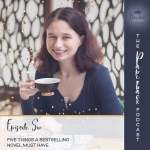 You’ll know how to set the tone of the story and the atmosphere, instead of sitting there wondering if you should have your characters run into an attractive man (romance) or find a dead body in the woods (horror). Now that you know what kind of story to write, it’s time to start putting all the nuts and bolts together. Even if you’re a pantser (meaning you write by the seat of your pants), you need to have some kind of direction or idea for your story. Otherwise, you might as well be rambling aimlessly. Who are my main characters? What happens to my characters to create a plot? What’s at stake for my characters? What are the rules of this world and how can I expand on this? What’s interesting about my setting and how can I involve my reader in it? People read for the characters— they’re what links everything together. Without characters, there’s no story. No plotline for them to explore. No stakes to create conflict in their lives. No reason for your story to exist. So take some time to figure out who’s telling the story and who’s involved in it? What’s my main character’s biggest problem? What needs to happen/change for them to want to, or be able to do something about it? How does this event occur? What is my character’s backstory? Does their upbringing, morals, or personality affect their lifestyle and their decisions? Ready to write and/or publish your book? My coaching programs assist aspiring authors to get clarity on their book idea, finally start (or finish) writing their book, and create an amazeballs book launch + marketing plan. Are you ready to work together and make it happen? Book your free, 30 minute discovery call today and let’s get started!